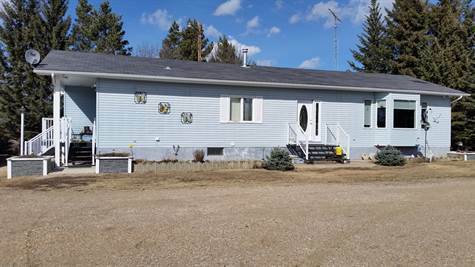 Style: Bungalow "with additional mobile home"
Year Built: 1973 "Mobile home part"
1,115 titled acres with beautiful yardsite located 28 miles northeast of North Battleford. Built in 1973 with subsequent additions, this recently renovated bungalow features a 3 bedroom 2 bathroom layout with finished basement. - Quonset/Shop (1996): 42x72, 110V & 220V, gravel floor straight wall. Walkthrough door and large sliding doors. - Garage (1986): 28x34 double detached, power 110V, concrete floor, 2 garage doors with openers and remotes, log siding, asphalt roof. - Small Barn (1952): 20.5x24.5, log siding, asphalt roof, power 110V. Wooden floor, 1 pen and 3 stalls + tack room. Hydrant in front of the barn. - Large Barn (2000): 48x30, metal siding, wood pole building, water hydrant inside the barn. - Garden Shed (2008): 8 x 12, log siding, wooden floor on skids, barn doors. - Vendor ran sheep and horses. - Total of 4 pens on the acreage.